Has someone coined TGIS–Thank Goodness it’s Spring–yet? If not, it’s mine because that’s what I say to myself when looking at the 10-day weather forecast (ignoring the April showers). All this sunshine has me scheming for ways to maximize the longer days and escape from the walls of my apartment. Picnics fit the bill perfectly. Surrounded by friends and food, picnics are a delicious way to celebrate the season. These days, parks are my go-to locales for picnics, but think beyond the grass to rooftops and beaches as the temperature steadily increases. Wherever you lay your blanket, here are some tips for how to pack a picnic from basket to booze. Make a List. Check it Twice. The key to a killer picnic happens way before you step foot in a park. Just like any other dinner party or elaborate meal, packing a picnic requires a bit of planning. The menu is a good place to start, and see below for specific food-related tips. But go beyond the food and make a list of all the things you’ll need outside the comfort of your house—everything from the drinks, plates, cooler packs, and trash bags, to blankets, entertainment, and sunscreen. Then check this list before leaving the house to be sure you’re ready, corkscrew and all. Potluck and Roll. Doesn’t a meal just taste better when it’s a collaborative effort?! Picnics are no different. I prefer to distribute by course, to avoid too much overlap. One or two people bring main dishes, someone else a salad, and another covers dessert. Let your less-culinary inclined friends bring drinks and appetizers—both of which can be picked up at the nearest grocery store or corner bodega on the way to the picnic destination. Be sure to also divvy up non-food items like utensils/plates, blankets, music (and speakers!) and games (think bocce, cards, and frisbees). Forgo the Forks. 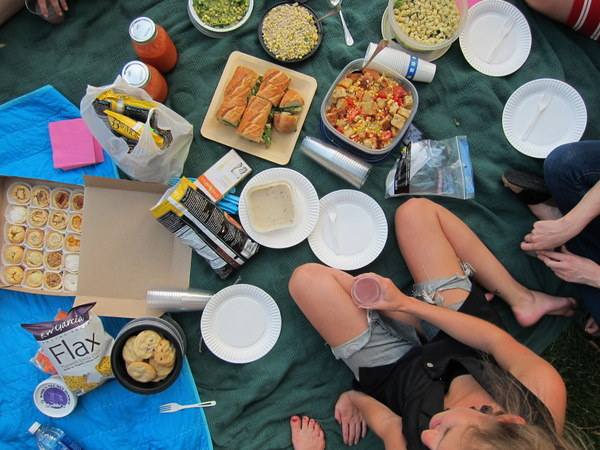 As always with potluck food, think portability when deciding what to pack for your picnic. To avoid the mess of spilling food all over your lap and blanket, skip the forks and opt for finger (or hand?) food. Sandwiches are a classic potluck dish because not only can you put virtually anything on a sandwich or wrap, but you can eat them easily too. But instead of preparing sandwiches in advance, prep all the ingredients ahead of time and set up a sandwich bar where people can make their own. This is great for potlucks, where everyone brings an ingredient or two–bread, condiments, meat, and other fixin’s. This build-your-own bar isn’t limited to straight sandwiches either. Taking inspiration from street and truck vendors, I can imagine a Mexican picnic with tacos and burritos or a Middle Eastern feast with falafel and other pita-stuffing goodies. Other finger foods like meatballs or black bean cakes and cold soups like gazpacho make great additions to a picnic menu. And it’s not a meal without a little something sweet. I’m all for a big pie or cake, but that’s not picnic practical. Instead, I’d go for bite-sized treats like cookies, brownies or bars that require nothing but two fingers and two bites to disappear. Pack a Punch. Glass won’t work in most public spaces, so avoid the nasty stares from roaming police officers by packing punch. Celebrate the seasonal fruit with a boozy sangria or spiked lemonade. If beer is a must (and sometimes it is), don’t forget the koozies! But before bringing booze on location, take a look at the guidelines so you at least know what rules you may or may not be breaking. Relax. Time to forget the list and take it easy. Have fun with your friends!